Regardless of what plant material you have, namely, your grown onion sets or purchased from the sellers, it must be prepared for landing. 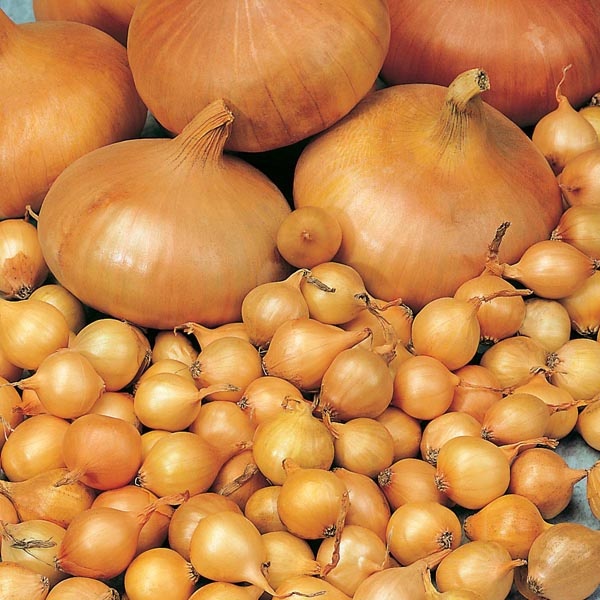 Sets it is necessary to sort and to remove dried, diseased and diseased onions. At the same time it is sorted by size. First planted large onions, then medium and small. This is done for uniform germination. A few weeks before planting, the sets should be warm up that will help to avoid strelkovanie. Especially it concerns small bulb purchase if you do not know the storage conditions. Your sets with a large size and stored at low temperatures, also need to warm up. Warm up sets scattered about batteries warm or carry the warm spring days in the sun. 3-4 hour sets are soaked in saline solution. Table salt 1 tbsp. tablespoon dissolved in one liter of warm water and immerse the bulbs in a solution. So they don't pop up, the bulbs can be pre-bulking in a nylon stocking or gauze bag. After the salt bath sets required rinse well with clean water several times changing the water. Some gardeners use a stronger salt solution (pack of salt to half a bucket of water), but in any case, always it is necessary to wash off the excess salt. Salt has a detrimental effect on eggs of the onion fly, mites, thrips. To some extent, it is prevention from disease. Washed out onion sets again soaked for a few hours in a dark solution of potassium permanganate from diseases as onion prone to fungal infections. After 2 hour sets again washed with water and gently clear it of excess water. Sets ready for planting. Instead of potassium permanganate suitable chemical agents such as copper sulfate, copper oxychloride. If there is a need, sets you to stimulate the roots to soak in the solution of EPIN, zircon, HUMATE in solution of mineral fertilizers. However, the bow has plenty of power and does not need such additional treatments.